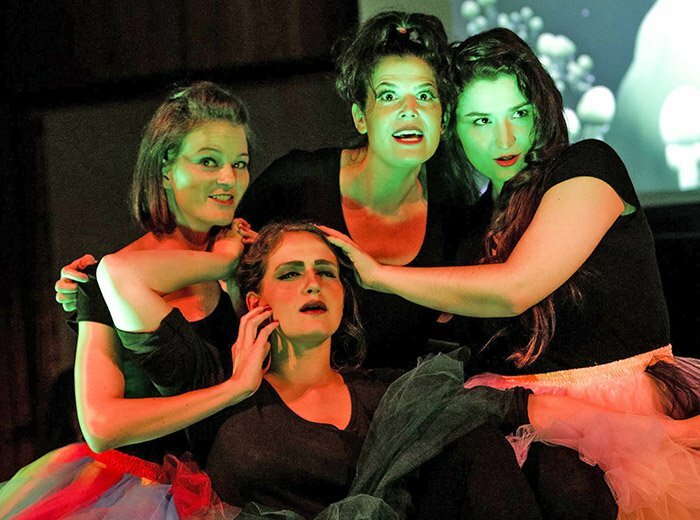 Midsummer by Scott Wheeler and Don Nigro — with Megan Bisceglia, Ann Fogler, Rebecca Krouner and Celeste Godin (Dan Busler photo). Boston Opera Collaborative’s fourth annual “Opera Bites” feast began Friday and runs through Sunday at Longy’s Pickman Hall. The operatic equivalent of short stories came in the form of seven 10-minute operas (six premieres) presented cabaret style with tables replacing seats on the first floor and normal seating in the balcony. A festive reception before the performance produced, somewhat paradoxically, a focused and fully attentive audience. Simple staging with minimal sets and scene changes brought about by lighting and a background projected onto a large flat-panel screen put the emphasis on the performers’ top-notch singing and acting. Onstage musicians, conducted by Dan Ryan, unobtrusively supported, accompanied and enhanced the singing. Humor, tragedy, philosophical insights ensued, in a nimble succession of settings on a theme of separation and loneliness. Midsummer gave us a charmingly “tough-guy” leather-jacketed Puck (Francis Rogers) and his fairies in an existentialist crisis, facing oblivion and mortality against a background of giant mushrooms. 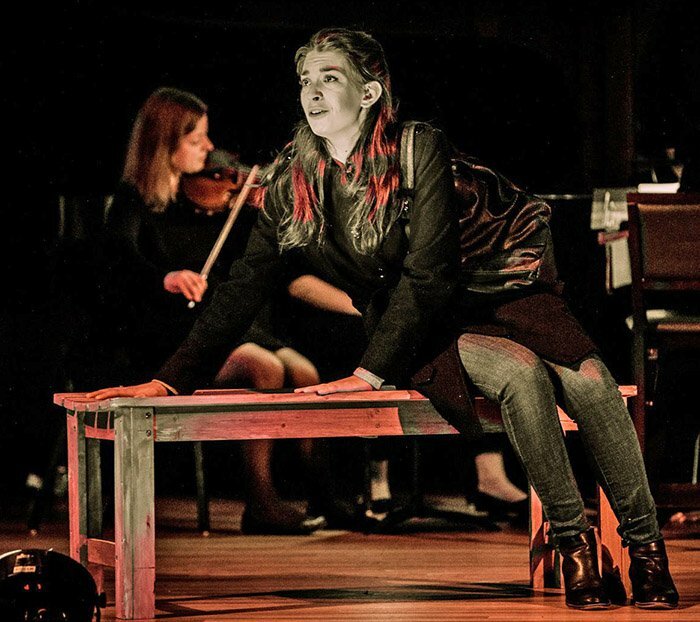 Scott Wheeler’s score and libretto worked seamlessly in an entertaining and thought-provoking rumination, by turns sad and humorous, on the necessary illusion of mythological belief as a resource for fathoming existence. Luminous and lit from beneath like Degas-dancers, frightened by the dark biological forces of the forest yet also intrigued and attracted, the fairies brought about a shimmering realm of ambiguity, suspended between music and speech, open-ended and nicely unresolved. The Battle of Bull Run Always Makes Me Cry, by Bailey Holland, composer and librettist, was a masterpiece of lyricism and understatement. As in a Murakami tale, the ordinary plot of a woman narrating a date to her two women friends, but also reliving it, opened radical doors and perspectives on the extraordinary. Here again, score and text worked indivisibly to reveal the transcendent in the mundane, the unhoped-for in the pedestrian. While seemingly exploring the possibility and impossibility of bringing about meaningful human contact, Holland created a soaring and moving tribute to our fragility. Somebody please nominate Jonathan Bailey Holland for a MacArthur Fellowship. Immediately noticeable in Absent Grace was the mysterious and other-worldly atmosphere created by the mournful and solitary stage set and by composer Marti Epstein’s discreet overture, evocative of instruments tuning before a concert, suggestive of the fact that we are never sufficiently attuned to the score that is life. Epstein’s remarkable music functioned in tandem with Claudia Barnett’s haunting libretto, telling the story of loss, grief and forgiveness in its own ineffable idiom, more as a dialogue throughout than simple accompaniment. Clearly, Barnett’s beautiful, succinct idea of strangers who need each other in order to heal through substitution and who discover what they live through transposing it into a shared spiritual experience, deeply inspired Epstein’s music. Wes Hunter as “Him” and Carley DeFranco as “Grace” were nuanced and moving in navigating subtle shifts of mood. The first half of the concert ended with the brilliant, and brilliantly executed, Misfortune, with a score by Eva Conley Kendrick and a libretto by Mark Harvey Levine, based on the latter’s play. Wry, succinct, and hilarious, vast in its impact and sparse in its means, Misfortune is an elegant tour-de-force. Special kudos to Stephanie Hollenberg for her crucial deadpan delivery. After more wine, cheese and douceurs at intermission, we resumed our places — sitting around stylish tall tables in the orchestra, and in regular theater seats in the paradis (balcony) from where the flickering lights of the tables below looked like stars. (We really must invent a new word to describe the special atmosphere that is created for the annual “Opera Bites”: cabaret-style seems too raunchy and urban, dinner-theater seems too commercial. The atmosphere is really more like an oasis — like an indoors Tanglewood lawn experience, patrician and whimsical, without an iota of stuffiness.) Before the show resumed, we were treated to a winning fund-raising intermezzo, with impressive full-throated citations from the opera repertoire, including Rigoletto, Carmen and Magic Flute. Sunshine Girl (by Samuel Wilson and Lila Palmer) nicely showcased the intrinsic variety of the “Opera Bites” format. Telling the story of two sisters evacuated from London in 1939 during the blitz, it remained solidly anchored in a very effective and wrenching sort of realism. One sister is lucky in her host assignment and flourishes, whereas the other is unfortunate and is exploited and abused. The score contributed to enhance the divergent fates of the two sisters, reminding us that anyone, anywhere, at any time can become a refugee, dependent on the kindness of strangers. Rachel J. Peters’s Steve unfolded, next, with a winning Horatian humor, a mild, gentle and sympathetic mocking of human folly. Wes Hunter returned from his encounter with Grace, now as the reincarnation of Jennifer Caraluzzi’s deceased pet. Ruminations on loneliness and emptiness, punctuated by involuntary reactions to the words “speak,” “sit” and “stay” were brought off delightfully, as was a duet on “take me home”. The evening ended with a bit of slapstick, the marvelously ridiculous A Case of Anxiety, by Tony Solitro based on the play by Mark Harvey Levine. Ethan DePuy, facing death by toothbrush, sweater, toaster, and other means, confronts the question: how many times must we die before we decide to live? A love duet by Celeste Godin and Andrew Miller holding hands over DePuy’s body was a special moment of silliness, reminiscent of Gilbert and Sullivan in the soaringly beautiful score. Serio-ludere thus ended the evening on a light-hearted, yet unmistakably intelligent note. Bravi tutti! Mention should also be made of I Pagliacci in the Intermezzo "Beg"; it got me to give them $100 Saturday night. But while Friday was sold out in all the higher levels, there was one table and one seat that didn't get occupied Saturday night and they could have squozen in some more in the regular seats. "Yo' ain't seed nuthin' yet!" as Al Jolson supposedly said; Opera Bites is not to be missed this year--or any other year. Il Trittico condensed and on steroids, to use the current cliche. You only have an hour or two left before it's gone!